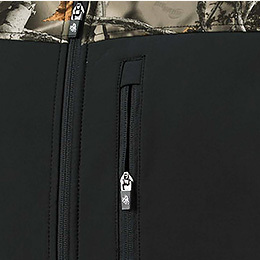 Men's Camo Hurricane Softshell Jacket is rated 4.8 out of 5 by 239. 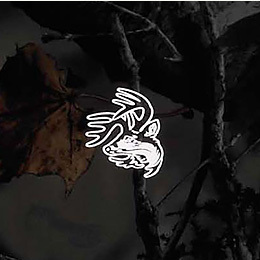 The story of the Hurricane softshell: A jacket whose shell could not be tamed. 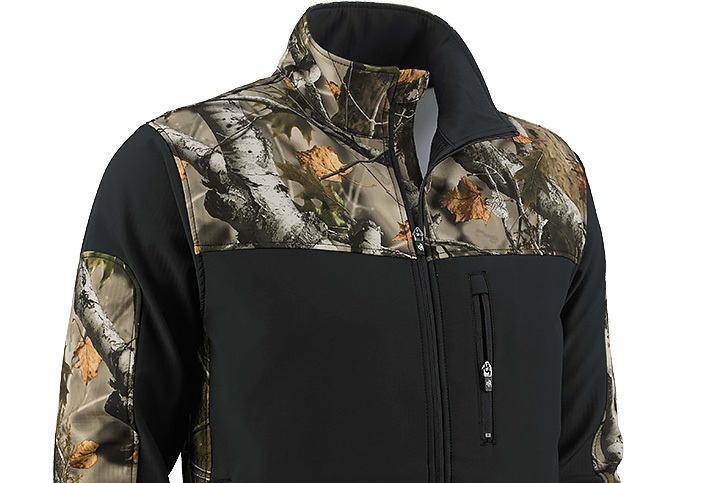 Its exterior is finely weaved to resist burrs, leaves, and anything else the woods throw your way, so you can trust this jacket to be your trail companion wherever your path may lead. The tighly woven softshell fibers are really good at blocking wind and rain. 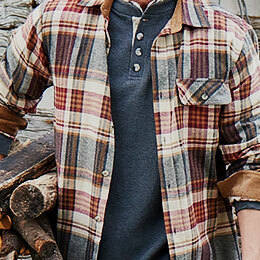 Throw in the easy-moving stretch polyester, and you have a jacket that provides ultimate active comfort all day long. 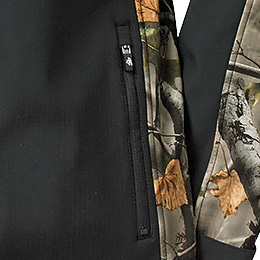 Our Men's camo softshell stands a level above the competition. Advanced micro-weave shell that’s wind/water resistant, breathable, and has the perfect amount of stretch – making it versatile and comfortable for any outdoor activity. Featuring two large side zippered pockets, one vertical chest zippered pocket, hook and loop adjustable cuffs, and a stand-up collar with soft fleece edging to keep the chill out. 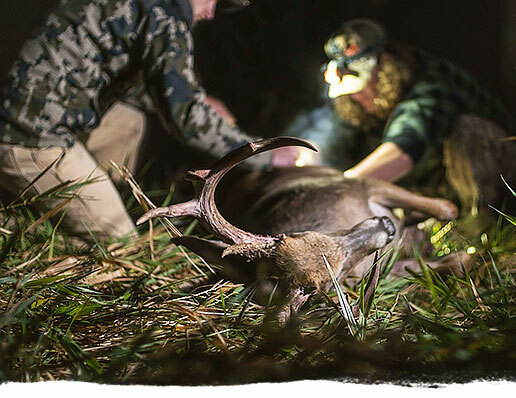 The hurricane softshell jacket is a shed hunter's best friend! The outer shell stops thorns from penetrating and won't get shredded be the thick nasty areas you crawl through in sear of antlers. Perhaps, best of all, it doesn't collect burs! 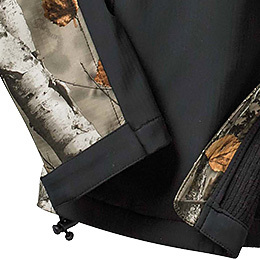 It's the perfect lightweight jacket for walking around in the woods or running around town. Rated 5 out of 5 by Tony from The jacket that fits! Great fitting jacket. Warm and ready for the weather. Better then I was expecting. 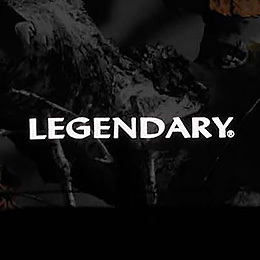 At a legendary price as well. Does the bur resistant qualities apply to beggars ticks, beggars lice/stick tight/stick seed? It seems like these little buggers have the ability to stick on anything! We haven&rsquo;t tested different species of plants to be able to confidently say yes to this question. 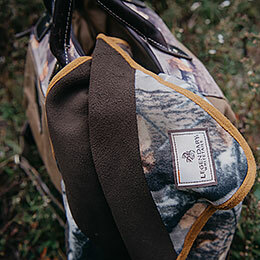 However the material used was chosen for its properties of durability, tear resistance, and resistance to things like burrs and seeds sticking to it for the purpose of being the best jacket to wear while walking through the woods. Why can&rsquo;t I find this jacket in &ldquo;legends black?&rdquo; I&rsquo;ve searched everywhere! 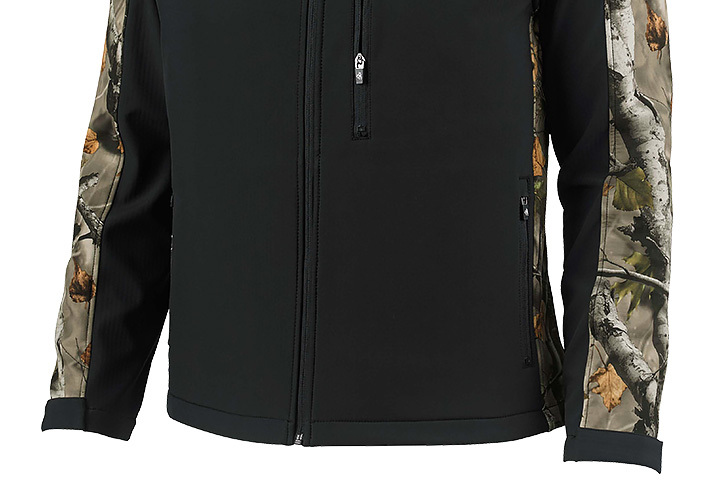 I apologize for any confusion, but the Legends Black style Hurricane Softshell Jacket went to a discontinued status back in 2015. Is this jacket quiet or is it noisy when it rubs against itself? This jacket is pretty quiet when it rubs against itself. 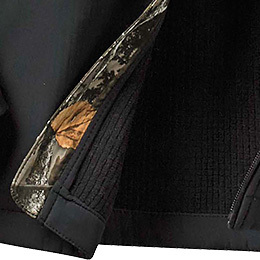 Does this jacket have the pockets like the vest for a weapon and magazine? 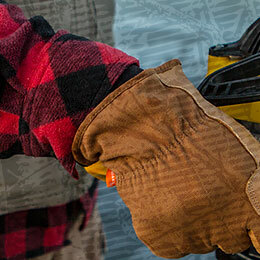 This jacket does not have conceal carry pockets like our Canvas Cross Trail Vest does. What are the zippers and rails made of on these jackets. The zipper teeth are plastic and the zipper pull is metal. Does this jacket run true to size? &nbsp;I am a big tall guy. &nbsp;3xlt would be great but isn't an option. &nbsp;If the 2xlt runs big, I need the length. &nbsp;IF it runs true to size, I probably need the 3xl for body. &nbsp;Thanks! According to other reviews, this jacket does appear to run a bit larger. 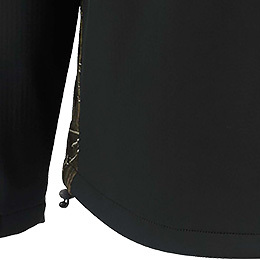 However, we do not offer a 3XL-Tall size, the talls are only available up to 2XLT. We do not have a specific temperature rating on this jacket. This does all depend on the person, however it would not be warm enough for below freezing temperatures for most people.